I think it was 1998, and the drawing office I was working in at the time was buzzing with anticipation. Being the CAD manager, I controlled the procurement budget for office equipment. Due to an excellent previous year, the powers that be had increased my CAD hardware budget. The CAD workstations had been upgraded already, so I had ordered the latest and greatest HP inkjet large-format plotter (known as the HP DesignJet series). They had been designed specifically to run with AutoCAD and other Autodesk products, and it meant that all my CAD Jedi Padawans no longer had to trek down to the print room in the basement to collect their prints. Their prints would be there, in the CAD room, all bright and shiny. I had just saved hours of drafting time. No more chin-wagging in the print room, no more sneaky cigarette breaks outside the fire exit of the print room. So draconian I had become, so drunk with power. The Emperor would have been proud. I jest. My CAD guys were chuffed to bits to have the latest HP tech in their CAD room! These days, I sit down in the site office. The “wonderful” British weather has kicked in, and the usual howling wind and horizontal rain has commenced. I smile to myself and crank up my iPad to sit with a hot cup of tea and check the latest drawing updates from the site team. Using Autodesk 360 and AutoCAD 360’s Design Feed, I don’t even need to venture outside. The site team members have used their iPad cameras to take pictures of the snagging needed onsite, and provided the necessary commentary in the AutoCAD 360 Design Feed for me to see what needs to be done. All I need to do is mark up and comment on the required revisions in AutoCAD 360 for my CAD team back at base to see what needs to be done. Plus, I am reassured that the revised drawings will be ready by Friday lunchtime for electronic issue. No need for five paper copies of every drawing. The drawings get revised and emailed via eTransmit in AutoCAD to the appropriate parties, all in a compressed ZIP file to save space. Wow, haven’t we moved along? I can still remember trying to get a large-format drawing flat on the hood of my car, held down with house bricks in this weather. I take a mouthful of my hot tea and feel rather satisfied that we have adopted the latest tech for my CAD team. When the iPads arrived, the CAD team members were like kids with new toys. Proud is an understatement! Once they had been trained on Autodesk 360 and AutoCAD 360, the lightbulbs went on. Sharing drawings and comments via Design Feed became the norm. Post-it Notes became a thing of the past, and the team really began to enjoy the ability to work together, both in the office and onsite. AutoCAD 360 was a real hit, allowing the CAD guys to check, snag, and create designs onsite. If something needed changing, it could be done there and then. No more red pens and then trekking back to the office to make the changes. This new technology empowered them, even energized them. It gave them much more control over the design process, and gave them the ability to work on-the-fly onsite. No more survey pads and pens needed! Fig.1 – Typical screenshot of AutoCAD 360 on the iPad. 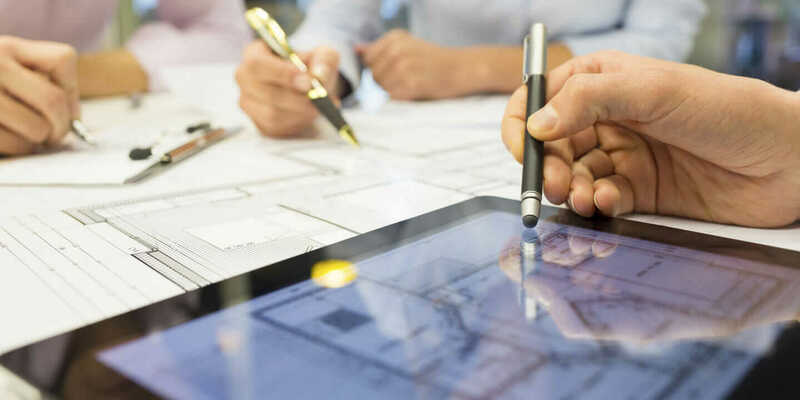 The cloud allows you to store files and documents—as well as collaborate using those files and documents (including your CAD drawings and models)—on the Internet. When this first went live in the CAD office, it became a great enabler of productivity. Everyone had access to the latest revision of all the project documents. Plus, when that version of a file was signed out, it was locked to avoid cross-editing of the same file. It sure beats looking up physical documents and drawings in the document folders stored in the office. Autodesk 360 is a typical cloud collaboration tool, but there are many others out there in the marketplace. I mention Autodesk 360 because it is the tool I’m familiar with because of my experience with Autodesk products. It has features for easy collaboration, such as seamless links to AutoCAD 360 (the cloud/Internet-based version of full AutoCAD), plus links to many other Autodesk cloud-based tools. It is also available on Apple and Android devices, providing mobility. Using just a tablet, you can head out to the construction site, snag drawings live and online, and the information goes straight back to the office, ready for you or another CAD Jedi to pick up and run with. As I said above, no more red-pen-on-paper drawings! Fig.2 – Typical screenshot of Autodesk 360 on the iPad. Whilst Autodesk 360 acts as the collaboration facilitator here, you may also need to consider a repository for storing your data online. Again, there are many options out there, and they act like a virtual portable hard drive. I still use portable hard drives with the CAD team, but sometimes, for mobility, online can be extremely useful. I like using Dropbox with a Pro account of 100 GB of online storage. I create a lot of CAD training videos for my team, and I can then share folders from my Dropbox with them. Google has its own service, called Google Drive, as does Microsoft (SkyDrive). All offer a free option, just like Autodesk 360 does, with a small amount of storage, but if you need more space, you have to pay for pro accounts. Such is the way of cloud storage, but you get what you pay for. Look into each option, and decide which one works best for you. Fig.3 – Typical screenshot of Dropbox on the iPad. If your company or organization has not adopted these strategies yet, do not be afraid to build a business argument for them. Become the agent of change and progress, and, more importantly, productivity and efficiency. The cloud is not going away any time soon, neither are mobile apps such as AutoCAD 360. This is the way forward, the future of CAD. Electronic file formats such as DWF and PDF will always be there, no doubt about it. Embrace the progress! So which way do you go? There are so many ways to make this work and work well. My suggestion is to do your research. Look at all of the options out there and decide what will make your CAD team more efficient and productive. Talk to other people in your CAD network to see what they have adopted. Look at how much storage space you get for your buck (or quid, in my case). Check out what works well for you, and build a business case that covers all the options you need. Then, decide on how to collaborate. It’s up to you! For tips on effectively managing your CAD team, read 3 Must-Know Tips to Be a Successful CAD Manager. And check out this video from CAD Consultant/Cadalyst Contributing Editor Robert Green about the importance of CAD managers meeting deadlines.